Australia plans to dump one million tonnes of sludge in the Great Barrier Reef. Despite strict laws on dumping waste, the Great Barrier Reef Marine Park Authority (GBRMPA) gave the go-ahead. It says the works ensure boats and ships "can safely and reliably access ports and marinas". It comes one week after flood water from Queensland spread into the reef, which scientists say will "smother" the coral. The industrial residue is dredged from the bottom of the sea floor near Hay Point Port - one of the world's largest coal exports and a substantial economic source for the country. Larissa Waters, senator for Queensland and co-deputy leader of the Greens Party, called for the license to be revoked. "The last thing the reef needs is more sludge dumped on it, after being slammed by the floods recently," she told The Guardian. "One million tonnes of dumping dredged sludge into world heritage waters treats our reef like a rubbish tip." 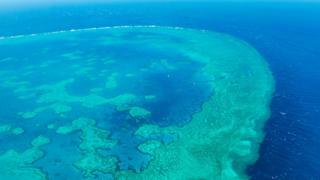 It's just "another nail in the coffin" for the World Heritage-listed Great Barrier Reef, which is already under stress due to climate change, according to Dr Simon Boxall from the National Oceanography Centre Southampton. "If they are dumping it over the coral reef itself, it will have quite a devastating effect. The sludge is basically blanketing over the coral. "The coral relies on the algae, that's what give them their colour and what helps them feed - without this partnership the coral will suffer dramatically." Dr Boxall says his worries about sludge-dumping are short-term - with the current Australian summer a time for "rapid algae growth". A GBRMPA spokesman says all of the material being dredged is naturally-occurring and was approved following a "comprehensive" assessment which included a 60-day public comment period. It says the permit allows a disposal site of 14.5 sq km within the park, and that the "spoil material will not be disposed of on coral reefs". "Without maintenance dredging, the Marine Park is left at a greater risk from accidents or grounding impacts of stranded vessels," it said in a statement. The North Queensland Bulk Ports Corporation, which looks after Hay Point, said dumping the sludge will have a minor environmental impact. In a statement issued online, the corporation claimed its reports showed the risks to be "predominantly low with some temporary short-term impacts". Dr Boxall says the impact will be lessened if the sludge is taken far enough offshore, but that it will still contain high amounts of harmful materials such as trace metals. "If it's put into shallow water it will smother sea life," he says. "It's important they get it right. "It'll cost more money but that's not the environment's problem - that's the port authorities' problem." Last year, Australia pledged A$500 million (£275m) to protect the Great Barrier Reef - which has lost 30% of its coral due to bleaching linked to rising sea temperatures and damage from crown-of-thorns starfish. One of the threats listed at the time was "large amounts of sediment".